Hand painted glass lanternslide of a ship at sea. 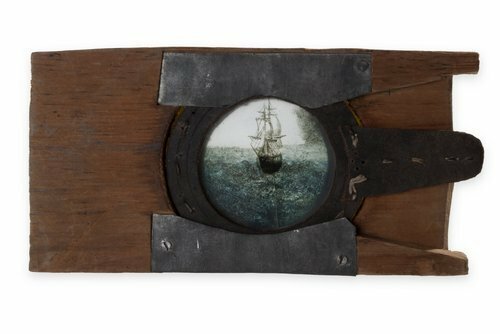 This slide is housed in a leather frame with a lever so that the ship can appear to be rocked back and forth on rough seas. This slide is part of a collection made by Samuel Reader between 1866 and 1913. Reader was a Kansas farmer who was active in the early Topeka community. He built two homes, served in the Civil War, and wrote in a diary nearly every day for 64 years. Reader recorded the making of this slide in a diary entry on December 23, 1866, noting that the glass slide cracked as he was assembling the lanternslide. He then altered the scene, making the crack resemble a mast. Reader began painting slides in 1866 and continued throughout much of his life, holding magic lantern shows for the local community in his house and at church.